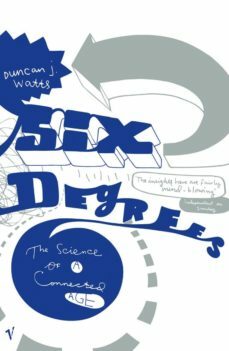 Six degrees of separation is a cliche, as is its a small world, both cliches of the language and cliches of everyday experience. But its also an intriguing idea with a long history and some surprising implications. We all live in tightly bonded social networks, yet linked to vast numbers of people more closely than we sometimes think. Scientists have begun to apply insights from the theoretical study of networks to understand forms as superficially different as social networks and electrical networks, computer networks and economic networks, and to show how common principles underlie them all.Duncan J. Watts explores the science of networks and its implications, ranging from the Dutch tulipmania of the seventeenth century, the success of Harry Potter, the impact of September 11th on Manhattan, to the structure of the world wide web.